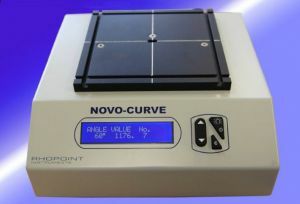 Product Description The Novo Curve is a unique 60 degree Angle Glossmeter for the measurement of gloss on curved surfaces and cylindrical areas. -Also measures standard flat objects. Supplied complete with Novo-Soft QA software and data cable. This enables you to download stored readings from your gloss-meter memory to a PC for storage or further analysis. Features include the ability to batch and cross-reference results from multiple instruments and produce graphical reports. Results can also be exported to MS Excel or other compatible PC based software. -A Jig for the repeatable placement of cylinders on the Novo Curve. The Cylinder size should be in the range of 5mm to 150mm radius. This low cost option eliminates the frustration and speeds up measurement considerably.